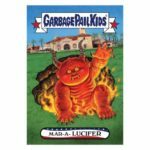 The GPK themed week continues for the third straight day. 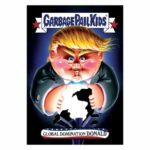 Today Topps launched Garbage Pail Kids Trumpocracy 2017 cards #21-#23 (Artist 21- Simko, 22-?, 23-Dejarnette), and GPK Network Spews #69-#70 (Artist-?). 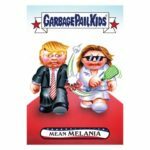 Topps is also offering one Trumpocracy Wacky Packages card today. 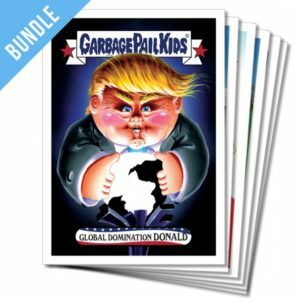 After weeks of pushing Wacky Packages, this week has been mostly GPK. Today’s five GPK cards is the most offered in many weeks. Each card can be purchased for $9.99 or in lots of 5 for $29.99, 10 for $49.99, or 20 for $79.99. A six card bundle featuring one of each card is available for $39.99. Free shipping in the US is available with the SmartPost option, while international shipping is $10. The cards will be available on topps.com for 24 hours. 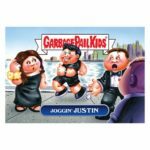 Topps will release the print run at the end of the sale. Here are pictures of today’s cards.